Forecasted grower budget intentions are a critical planning assumption for crop input manufacturers, distributors, and retailers. Even small year-over-year swings in budget intent within a category, positive or negative, can have dramatic influences on production/supply, logistics, marketing effectiveness, the nature of customer(s) relationships, organization/sales team/sales person revenue performance, and ultimately the bottom line. Midwest corn/soybean growers surveyed continue to actively seek new approaches and technologies to improve their business. 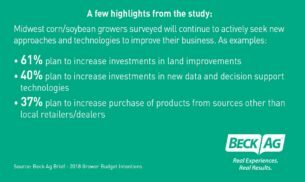 As examples: 61% plan to increase investments in land improvements, 40% plan to increase investments in new data and decision support technologies, and 37% plan to increase purchase of products from sources other than local retailers/dealers. Not surprisingly, we continue to see a theme of cost containment, with flat to lower per-acre expenditure for most corn and soybean input categories. While this data shows a small shift in acres from corn to soybeans, this study indicates a small year-over-over increase in acreage for both crops. Clients have used this data in the past to compare against other market information they have gathered and trends they have identified. Others have used the information as a foundation for business training and planning, in combination with Beck Ag’s market instruction or strategy capabilities. To learn more about this study, discuss results and implications for your business, or to brainstorm actions your organization should consider for success, please contact Robert Weaver, Vice President of Ag Insight at rweaver@beckag.com or 317-840-8046. Beck Ag Briefs are voice-of-customer reports generated via our Ag IQ and Ag Insight capabilities. Beck Ag’s Ag Insight division delivers the highest quality marketing research solutions to help our clients achieve desired business results. Ag Insight solutions are designed and delivered by a holistic and integrated approach to problem solving. Ag Insight is one service in Beck Ag’s overall approach to providing actionable go-to-market solutions for agribusinesses.